Last week, Microsoft announced they were partnering with YouTube for an exclusive broadcast of the Halo 5: Guardians launch event to stream the festivities and special interviews around the world. Microsoft Store Flagship Store, New York – Microsoft stores celebrate the opening of its new Fifth Avenue Flagship with the Master Chief and Spartan Locke. Fans can line up to purchase Halo 5: Guardians and have a chance to have it signed by 343 developers! Janina Gavankar from the popular Hunt the Truth Halo audio series will also be in attendance, as will cosplayers from the 405th Infantry.Fans can line up as early as 10 a.m. on Monday, October 26 on 54th street, around the corner from the Flagship at 677 Fifth Avenue. Doors will open at 9 p.m. and the event will end around midnight. Experience the fast-paced action of Halo 5: Guardians multiplayer in real-life with the BOOMCo Breakout Arena, be one of the first to get your copy of the game, and get it autographed by members of the team at 343 Industries. Major Nelson will also be there giving away special prizes, including Xbox One consoles, Xbox One controllers and much more. Members of the Halo 5: Guardians development team and the voices of the Master Chief (Steve Downes) and Cortana (Jen Taylor) will also be in attendance.Doors will open at 12 p.m. on Monday, October 26 for the BOOMCo Arena in the parking lot at the nearby Office Depot (4900 25th Ave NE, Seattle, WA 98105), and Halo 5: Guardians gameplay will be available beginning at 6 p.m. The Microsoft store will host fans looking to pre-order Halo 5: Guardians at 6 p.m. with Halo-themed food, music via a DJ, early gameplay and more, followed by an autograph session with 343 Industries, Downes and Taylor from 9 p.m.—11 p.m.
Microsoft Store at Westfield Century City in Los Angeles – Come to the Microsoft store at the Westfield Century City to join in the party for Halo 5: Live and the highly-anticipated launch of Halo 5: Guardians. Meet voice-over actors from the game, including Darren O’Hare (Lasky), Q&A with key 343 Industries developers and surprise celebrity guests. Fans will also have a chance to appear on the Halo 5: Live broadcast throughout the night. Lastly, it wouldn’t be a launch party without a live DJ, food, giveaways and some exclusive prizes.Lineup begins at 4 p.m. on Monday, October 26, with doors opening at 6 p.m. If you are interested in attending the events there is also more information available on each of the three Microsoft Store’s Facebook pages. The Halo 5: Live broadcast itself goes live at 6 pm EDT on October 26 and runs for six hours until midnight EDT. The broadcast will feature gameplay reveals, the premiere of the new animated series “Halo: The Fall of Reach,” and talks with the game’s writers as well as voice actors from the series. Halo 5: Guardians officially launches at 12:01 am on October 27th. What are you most looking forward to in the latest installment of the Halo franchise? Let us know in the comments section below. 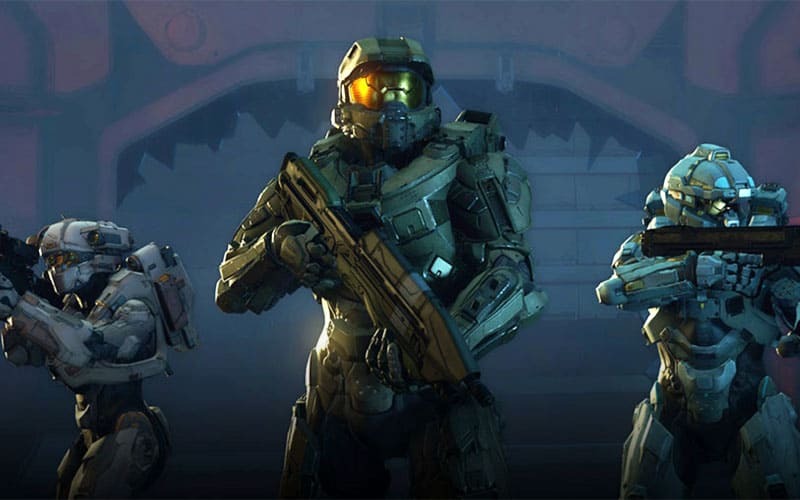 What are you most looking forward to in the latest installment of the Halo franchise?